I hope to one day have enough time to create lots of new products for my Teachers Pay Teachers store. For now, I only have a couple of things. The most recent product I created was a Transition Interview Survey. I use this to interview students for the transition piece in their IEPs. I don't know how much longer they will keep this link alive, but here it is for now! Here's a worksheet I created for my Language Arts methods class. The idea isn't original. I just needed a worksheet that wasn't copyrighted so made my own. Feel free to use it for teaching paragraphs. The lesson plan I created for this worksheet is included. Please let me know if you use this lesson plan and how it worked! Second Grade English Language Learners will use a graphic organizer worksheet designed as a hamburger to write an expository paragraph with guidance. 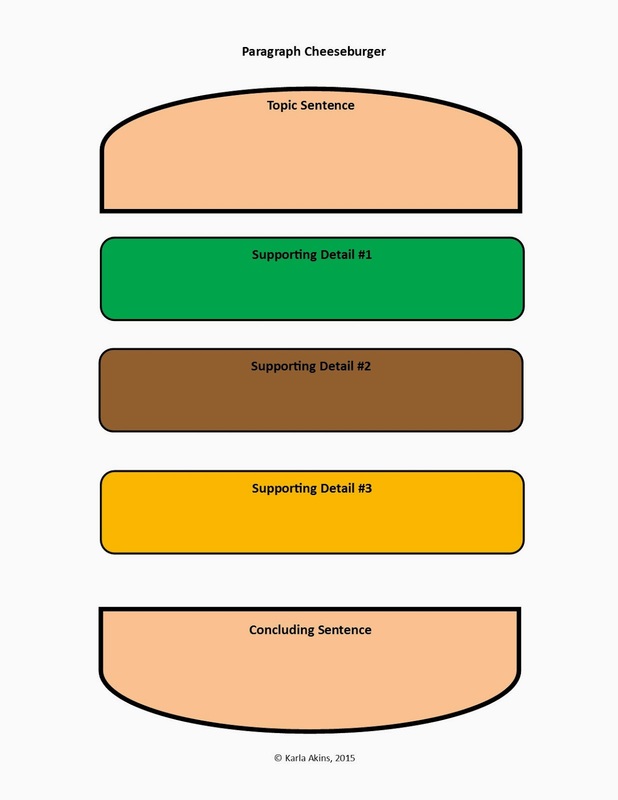 When given a graphic organizer designed as parts of a hamburger, students will write an expository paragraph with a topic sentence, three supporting detail sentences and a concluding sentence about making a sandwich. After completing the graphic organizer activity, students work will be graded according to the attached rubric with a score of 15 or above. Students who score 14 or below on the attached rubric will be given extra practice time writing paragraphs. Second Grade English Language Learners should be able to form letters and numbers correctly and space words properly so that writing can be read easily by another person (Indiana, 2014). Second Grade English Language Learners should understand how to build a hamburger sandwich. The teacher will explain that it’s not a very good cheeseburger when parts are left out It’s the same with writing a paragraph. A good paragraph needs all their parts in order to be “delicious:” a topic sentence, juicy supporting details and a concluding sentence. The teacher will hang a giant poster board piece representing the top bun of a hamburger on the board. The bun has the words “Topic Sentence” at the top. The teacher will model writing a topic sentence on the subject of building a hamburger sandwich. Example: “Delicious hamburgers are easy to make.” The teacher writes the sentence on the top bun hanging on the board. Following the modeled activity, the teacher will give each student a writing guide in the shape of parts of a hamburger like the one the teacher used on the board. Students will use the guide to write their own paragraphs about making a sandwich. The teacher will do a formative assessment by checking student’s worksheets for spelling and punctuation. After the writing guides are corrected, the teacher will guide students in accessing the class blog and logging in via a QR code and publish their paragraph onto the class blog. 1. The teacher will ask, “what makes a hamburger good?” After the teacher pretends to leave things out of an actual hamburger sandwich, such as one of the buns, or the meat, he displays the graphic organizer and explains that paragraphs have parts like a hamburger does, and if something is left out, the paragraph isn’t as good as it should be. 2. The teacher models writing a good paragraph using the giant graphic cheeseburger organizer on the board. 3. The teacher will ask the class to brainstorm ideas of the kinds of sandwiches they can write about. The teacher will write their ideas on the board so that students can choose one of them or one of their own that’s not included on the list on the board. 4. The teacher will guide the class in a discussion of how to write good topic sentences about each idea. 5. The teacher will also introduce the students to the three rubrics that will be used for this assignment: the self-assessment rubric, peer rubric, and the final rubric the teacher will use to evaluate their work before their work can be published on the class blog. Teacher will assure students that the teacher will let them know the proper time and place to use each rubric (Oregon, 2015). 2. The teacher will model thinking aloud to himself, “Peanut butter is healthy or good for you” and will write it on the board. 3. The teacher will model making a spelling mistake and explain that first drafts have a lot of mistakes and that they will have time to revise and correct mistakes later. 4. The teacher will model using “What, where, when, why” questions about the topic sentence in order to find details to write about. Example: For the question of “why,” the student may write: “Peanut butter is a healthy afternoon snack.” The teacher will refer to the “What, where, when, why” chart hanging at the front of the class to help students remember to refer to it to think of ideas. 5. Teacher will model using the five senses of taste, sight, hear, feel and smell to prompt ideas for writing. Example: “Peanut butter tastes delicious.” Teacher will refer to the senses chart at the front of the class to help students remember to refer to it to think of ideas. 6. Teacher will continue to provide guidance to students through the use of their own hamburger chart to create their own paragraphs about making a sandwich. 7. While students are writing their own paragraphs on the graphic organizer, the teacher will observe which students need more guidance and offer support. (Oregon, 2015). 1. Teacher will provide students with the attached peer and self-checking rubrics. 2. Students will assess themselves using the self-checking rubric before the revising process. 3. After the revising process, students will use the rubrics to check the work of two of their friends. 4. Teacher will guide students on how to use the rubrics to help them revise their work. (Oregon, 2015). 1. Students will hand their work into the teacher who will check it with the attached rubric. 2. 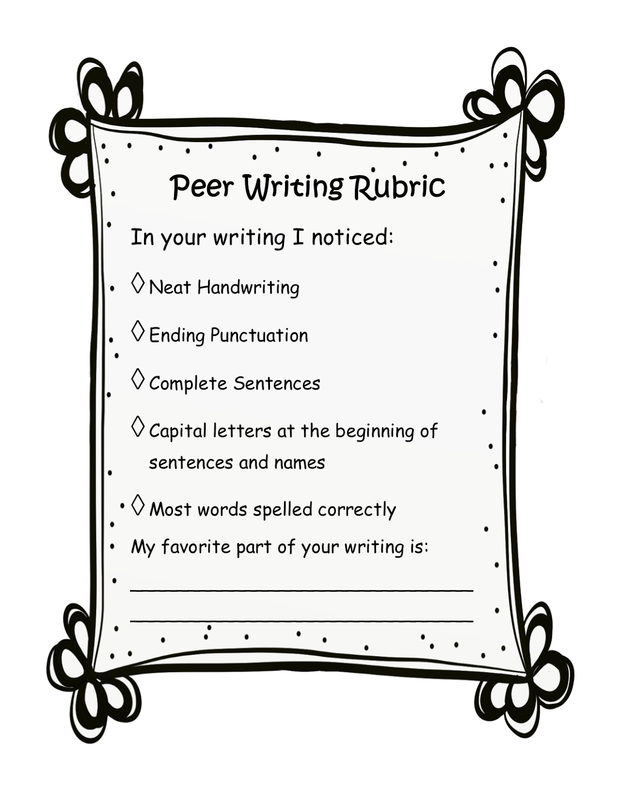 Students will refer to the teacher’s comments on the rubric when making the needed edits to their work before publishing. 3. Teacher will guide those who need extra help understanding the rubric. (Oregon, 2015). 1. Following teacher approval and editing, students will publish their paragraphs onto the class blog. 2. They will access the blog via the provided QR code on their cheeseburger graphic organizer. 3. Once all students have published their paragraphs, the teacher will display them on the smart board and discuss each with the class. They will note the required elements of each paragraph: topic sentence, supporting details and concluding sentence. (Oregon, 2015). During the worksheet activity, the teacher will observe which students are able to write sentences correctly and understand the worksheet’s process. While students copy their paragraphs onto the class blog, the teacher will observe which students are able to use technology to publish their work correctly. Students will publish their paragraphs onto the class blog. The teacher will review the posts with the class by projecting the blog onto the smart board. When a student’s paragraph is displayed on the smart board, the teacher will take a picture of the student with their paragraph and print it for the class hall display for Open House. Direct teaching: modeling how to make a proper cheeseburger; modeling using the cheeseburger graphic organizer on the board and guiding students through the writing processes: Prewriting, Writing, Revising, Editing and Publishing. Opportunities for the students to write, revise and edit their paragraph (repetition and practice) through using the graphic organizer and rubrics and publishing it onto the class blog. 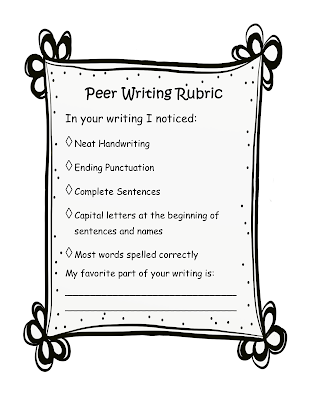 Opportunities to observe and learn from peer’s work through reading the class’s blog entries, assessing their own paragraph and assessing two of their peers’ with a peer rubric. Also discussing with the class the paragraphs they read on the class blog. The use of explicit instruction using the giant hamburger organizer visual aid on the board helps English Language Learners grasp the concept of writing a paragraph correctly. Most English Language Learners are familiar with American hamburgers. Using a hamburger helps them connect to the activity in a comfortable and non-threatening, fun way. Building on what they already know about hamburgers helps them find the vocabulary to write about making a cheeseburger sandwich (Haynes, 2007). The teacher making a less-than-desirable cheeseburger at the beginning of the class is a visual experience English Language Learners will remember. Using the non-example of a bad cheeseburger compared to a delicious one, also helps the English Language Learner grasp the concept of how to build a proper paragraph as opposed to one that is missing important elements (Benchmark Education, 2015). Providing guided practice opportunities and word banks helps novice English Language Learners succeed at writing paragraphs. Rewriting the paragraph on the computer to publish on the class blog also helps with spelling as the program underlines misspelled words (Haynes, 2007). Novice English Language Learners can also cut out the graphic organizer and work on one piece of it at a time so as not to be overwhelmed. As they piece the graphic cheeseburger together and paste it onto a blank page, they can visually and kinesthetically experience how a good paragraph is built (Benchmark Education, 2015). 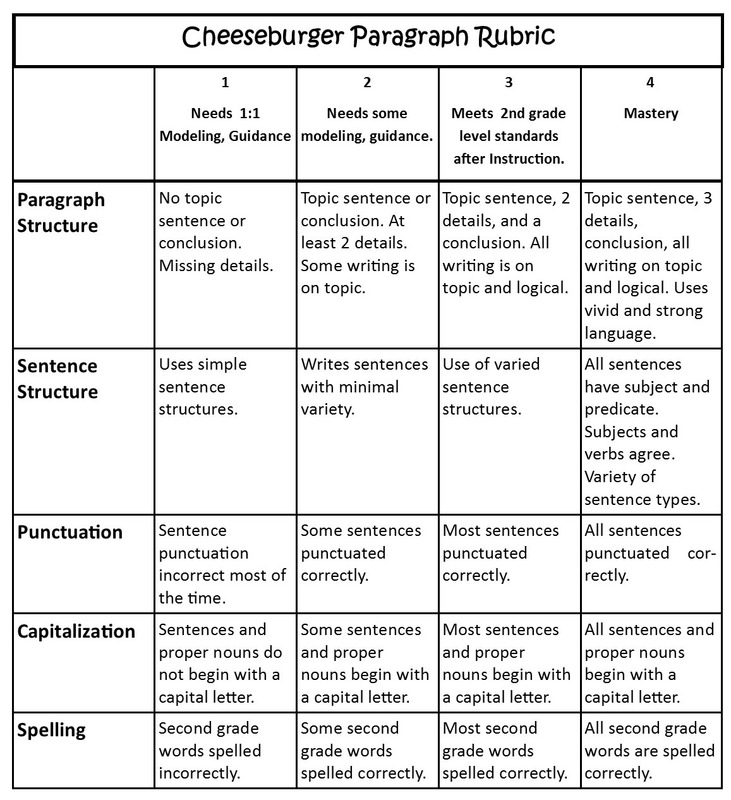 For students with autism, the literal making of a cheeseburger tied to the cheeseburger graphic organizer is a concrete visual example that supports the lesson (Harris, 2015). For students with autism, cutting out the graphic organizer and completing one piece at a time creates a clear beginning and end to the steps of the activity (Lovaas Institute, 2015). Students with dysgraphia can use a digital copy of the graphic on their iPads and type the sentence into it (Jones, 2015). Students will use the computer and Internet to publish their paragraph onto the class blog. Publishing the paragraphs onto the blog allows for all students’ work to be presented uniformly regardless of ability. The teacher will create a QR code for the students and publish it on the worksheet. When students scan the code with a QR reader application on their iPads, it will sign students into the class blog so they can publish their paragraph. During the graphic organizer worksheet activity, the teacher will observe students as they work through the worksheet and take note of who needs more guidance, practice and/or accommodations and modifications. Before students publish their paragraph on the class blog, the teacher will guide students through corrections and improvements in their writing. After the paragraph is written, students will assess their own paragraph. The students will assess two of their peers’ work after the revising process. 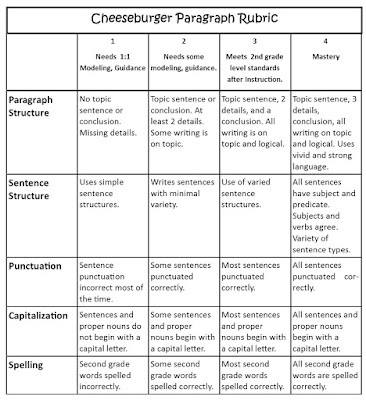 The teacher will grade each student’s final published paragraph according to the following rubric with a score of 15 or higher.